I was recently given two very large bags of wild garlic foraged from London by recent-Airbnb-guest-turned-friend-and-colleague Kanna Ingleson. Wild garlic is a leafy herb that tastes and smells much like garlic and grows wild in woodland across the UK. It’s a forager’s favourite but is oddly hard to find in my local area in Wiltshire. Thankfully, there are hard-foraging people like Kanna in this world and I like the slice of irony that found the big bad City saving my wild garlic day here in the countryside (let’s take a moment now to give it up to London for rocking the green space). 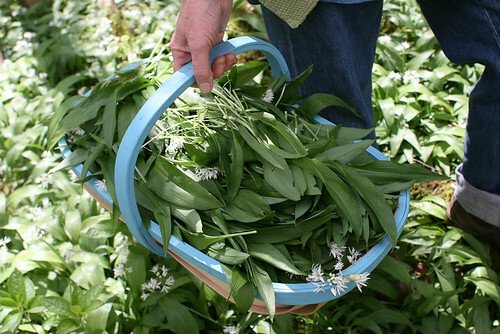 There is lots to be done with wild garlic: soup, frittatas, risotto, ravioli… and being so akin to garlic, wild garlic can easily be used in any recipe where garlic is called for. Add a few chopped leaves to a salad, stir the greens in with pasta, add to soups, stews, you name it. Yes, options abound, but even so, to eat all of this wild garlic within the couple of weeks it would survive in the fridge would not have done my breath (or my social life) any favours. So the question turned to storage. I did freeze some of the leaves, but decided to turn a fair bunch of it into pesto, too. 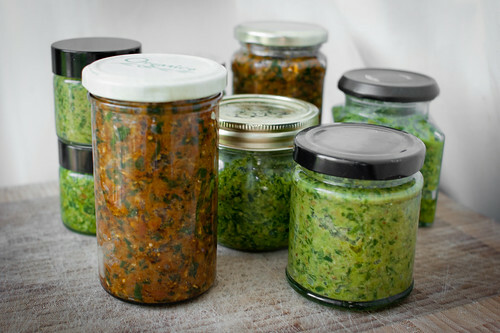 The first pesto was a no-brainer: walnut and wild garlic pesto adapted from this parsley pesto recipe that I love. I’ve made it before and it’s perhaps my favourite pesto (be it with wild garlic, parsley or any combination of herbs) because it is most versatile – I love it as a topping for pizza, swirled into soup or blobbed on toasted sourdough with sautéed mushrooms and arugula. 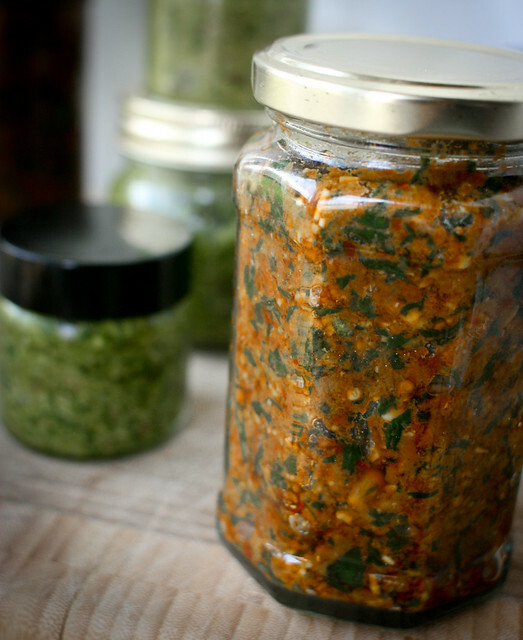 The second pesto is a sun-dried tomato and wild garlic pesto adapted from this recipe for sun-dried tomato and basil pesto. I omitted the garlic and parmesan, substituted wild garlic for basil and added lemon and more pine nuts. Kanna also gave me the idea of adding lemon zest and chilli, so that went in there too. Props to my friend Sam from Shipton Mill who knows a thing or two about delivery devices for good bread and was on hand to help bring the pesto together. We ended up eating a fair bit of it as an appetizer with Turkish flatbread, hot off the grill. If I have one struggle with pesto, it’s this: getting the consistency right. I like mine chunky, but it’s easy to over-process the nuts, creating more of a pesto paste, which is fine, but I like some texture. The easiest way I found to achieve this is by putting the nuts in towards the end of the pulsing process, or leaving them out altogether and hand-processing the nuts with a mortar and pestle. It all depends on what your up for, and how much you can be bothered. You’ll also notice that both of these wild garlic pestos are vegan – and you totally won’t miss the cheese. The wild garlic pesto keeps well in the fridge for a few weeks, as long as you keep it covered with a good layer of olive oil. Or do as I do and store it in the freezer (I freeze the pesto in ice cube trays). Put the walnuts into a food processor and process until finely chopped but still with some granular texture. Add the wild garlic and blitz again to chop the leaves, then begin trickling in the oil while the processor runs. Stop when you have a sloppy purée. Taste, season as necessary with lemon juice, salt and pepper. Store in the fridge – if you completely cover the surface of the pesto with oil so all air is excluded, it should keep for a couple of weeks. Or freeze it! Combine sun-dried tomatoes, and a bit of the oil in a food processor and pulse until the sun-dried tomatoes are roughly chopped (adding more olive oil as necessary). Add the pine nuts and pulse until those are roughly chopped, too. Add the wild garlic and pulse until it approaches the consistency you like for pesto (I like mine chunky). Add the lemon and a few good grinds of black pepper, pulse a few times, then taste. Add more lemon, salt, or pepper as you see fit. Mmm wild garlic. Must harvest more from the back garden! Ooh, does the wild garlic grow wild in your garden? Or did you plant it? How delicious Monica! I managed to forage a hefty stash of wild garlic from Cirencester at the weekend (there is plenty to be had round by the amphitheatre!) and you have inspired me to make pesto. Rose Prince made some rather delicious looking wild garlic flatbreads the other week (recipe on the Telegraph online) which looks like another awesome way of enjoying wild garlic whilst we can. Turkish flatbreads would be amazing I reckon! I need to get back to Ciren quick and stock up! 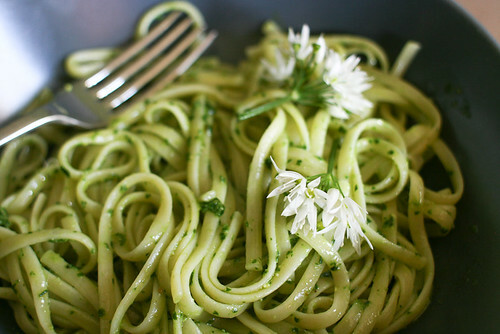 I wonder if we have anything like wild garlic here in the southeast! 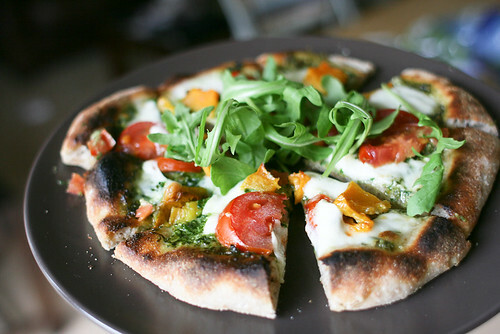 It looks so fresh & good – love the sundried pesto you made with it too. I’ve never cooked with wild garlic but those two pestos are begging me to have a go.